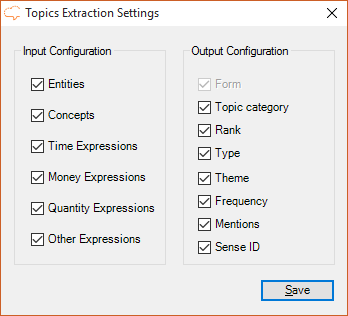 The Topics Extraction analysis integrates the functionality provided by the Topics Extraction API. It allows to extract different kinds of topics from a text easily and without any development. In this case, there are two differentiated sections: Input Configuration, with the options with which you will call Topics Extraction, and Output Configuration, to configure the output. 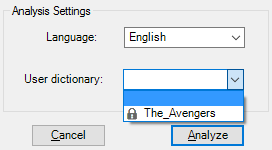 At least one type of topic must be selected to save successfully the configuration. Form: displays the name by which the topic extracted is identified. It's not configurable, so it always appears in the results. Topic category: shows the type of topic extracted. Rank: contains the order in which the topics have been detected. It's specific for each type of topic, that is, the first entity detected will be ranked 1, and the first concept will be ranked 1 too, and so on. Theme: theme of the topic according to the ones described in our ontology. Frequency: number of times the topic appears in the text. Mentions: mentions of the topic in the text separated by commas. 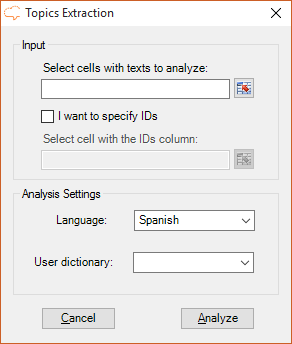 Sense ID: id of the the topic (sense ID in the user dictionaries). The results obtained from the analysis will be shown in a new Excel sheet called "Topics Extraction". This sheet will include a column with the source text, a column with the IDs if enabled, and then a column for each of the output fields configured in the advanced settings.